A H Mohammed, M A Mohamed, H Abdelghafar, M N Salem. 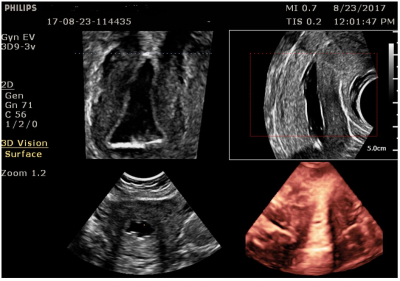 Virtual Hysteroscopy With 3D Sonohysterography In Comparison To Office Hysteroscopy For The Diagnosis Of Endometrial Polyps. The Internet Journal of Gynecology and Obstetrics. 2019 Volume 23 Number 1. Objective: to evaluate the accuracy of virtual hysteroscopy using 3D SIS in comparison to the office hysteroscopy in the diagnosis and the location of endometrial polyps. Study design: This is prospective observational cross-sectional study conducted in the maternal fetal clinic (private clinic in Sohag city). Women prepared for IVF were examined with virtual hysteroscopy with 3D sonohysterography between cycle day 8 – 10 then a hysteroscopy was done one or two days later. RESULTS: 87 patients were eligible for the study. Virtual hysteroscopy using 3D sonohysterography was not successful in 5 patients. We diagnosed endometrial polyps in 16 patients out of 82 patients (19.5%) by virtual hysteroscopy. The same finding was confirmed by hysteroscopy. Also, virtual hysteroscopy was highly accurate as in regard to the site of the polyp. Conclusion: Virtual hysteroscopy using 3 D sonohysterography may has a value for diagnosis of endometrial polyps with accurate identification of its location which can be done before hysteroscopy to facilitate the surgical removal. Endometrial polyps are common intrauterine localized overgrowth with variable sizes which are associated with both infertility as well as abnormal vaginal bleeding . Endometrial polyps are more common in infertile patient with a prevalence range from 4-40% [2-4]. Although hysteroscopy is considered the gold standard modality for diagnosis of endometrial polyps, many other imaging modalities are used such as 2D transvaginal ultrasound, 2D saline infusion sonohysterography, 3D ultrasound, and 3D saline infusion sonohysterography. 3D ultrasound has become an important tool in evaluation of gynecological problems with the advantage of the coronal plane . When combined with saline infusion, sonohysterography it is called 3D saline infusion sonohysterography which is highly accurate in the diagnosis of intrauterine abnormalities . Virtual hysteroscopy using 3D saline infusion sonohysterography with HD live was described by Saravelos and Li in 2017 . The accurate identification of site of attachment of endometrial polyps may facilitate surgical removal . The aim of our study was to evaluate the accuracy of virtual hysteroscopy using 3D SIS in comparison to office hysteroscopy in the diagnosis and the location of endometrial polyps. This study was a prospective observational cross-sectional study which was conducted in the maternal fetal clinic (private centre, Sohag city, Egypt ) during the period between February 2017 and September 2017. We obtained approval of the local ethical committee of the Sohag maternal fetal clinic (No. 5, 2017). All patients attending our clinic for evaluation by ultrasound before IVF cycles with suspicion to have normal transvaginal ultrasound or suspected to have endometrial polyps were considered eligible for the study after informed consent. We excluded patients diagnosed with Mullerian anomalies detected by 3D from the study. Whith the patient in the dorsal position, we inserted the sterile Cusco speculum slowly after lubrication with gel and then we cleaned the cervix by povidine iodine 10% using a swab. Then we insert an IUI catheter (Medisurg, Germany) without grasping the cervix with a tenaeculum (a step which is known to be painful). We then removed the speculum followed by insertion of transvaginal probe (4 – 9 MHz. ClearVue 650 Philips). We injected 5-20 ml saline through 20 ml syringe attached to the catheter. We opened the 3D volume box and we acquired the static volume in the sagittal plane. The volume was displayed in the multiplaner view (figure 1) and manipulated with z technique (figure 2). Then we rotated the A by the Z 90 clockwise so the C plane showed the transverse plane and the render plane is the transverse plane (figure 3). Then we used the single view with slicing to see the different plans of the transverse plane (figure 4). If the uterus was retroverted the reconstructed image should be rotated 180. All hysteroscopy examinations were using a 5-mm outer-diameter continuous flow Bettocchi hysteroscope with 30 direction of view (Karl Storz Endoscopy). Normal saline solution was used for distension of the uterine cavity at a pressure of 60- 80 mmHg. The hysteroscopy procedures were performed in an outpatient setting, using the vaginoscopic approach without dilatation. Virtual hysteroscopy using 3D sonohysterography was not successful in 5 patients (2 cases with axial uterus with unsatisfactory image by 3D, one with failure to introduce the IUI catheter, one failed to distend the cavity and one refuse to do it for fair of pain). The remaining 82 patients were examined. The age of our patient ranged from 22 to 40 years old. The duration of infertility ranged from 3 to 15 years. We diagnosed endometrial polyps in 16 patients out of 82 patients (19.5%) by virtual hysteroscopy using 3D sonohysterography which was confirmed by hysteroscopy with 100% sensitivity and specificity as shown in Table (1). Table (2) & (3) show the size and site of the polyp which was nearly matched between virtual hysteroscopy and hysteroscopy. Examples of the endometrial polyps visualized by virtual hysteroscopy are shown in figure (5). Finding by virtual and office hysteroscopy. The volume is displayed in the multiplaner view with A showing the sagittal plane and B showing the transverse plane and C showing the coronal plane. Virtual hysteroscopy using 3D saline infusion sonohysterography has a 100% sensitivity and specificity for diagnosis of endometrial polyps. The results of the present study agree with a previous study by Aboulghar et al . They also agree with the study by Makris et al where the 3D SIS was able to diagnose 19 of 20 polyps previously diagnosed by hysteroscopy . Our results also agree with the study by Sylvestre et al who reported sensitivity of 3D SIS was 100%. However, the specificity could not be calculated in this study because they did not do hysteroscopy in cases with normal 3D SIS . The result of our study is different form the study by Lagana et al who reported that the agreement between the 3D SIS and hysteroscopy was found in 84 cases out of 108 (77.78 %) . This may be explained by different ordinary technique rather than our virtual hysteroscopy technique. The virtual hysteroscopy using 3D saline infusion sonohysterography identified the correct site of the endometrial polyp in all cases. This is result is different from the result of the study by Inoue T et al  who found that the 3D SIS identified the correct site of attachment of the polyp in only 87.5%. The difference may be due to the new technique used in the virtual hysteroscopy. The advantage of the present study is that it is the 1st study to show the value of virtual hysteroscopy using 3D sonohysterography with a relatively good number of patients. The limitations of our study is that we did not test the accuracy of virtual hysteroscopy in the assessment of other uterine lesions such as intrauterine adhesion or congenital anomalies of the uterus. Virtual hysteroscopy using 3D sonohysterography may has a value for diagnosis of endometrial polyps with accurate identification of its location which can be done before hysteroscopy to facilitate the surgical removal. 1. Salim S, Won H, Nesbitt-Hawes E, Campbell N, Abbott J. Diagnosis and management of endometrial polyps: a critical review ofthe literature. J Minim Invasive Gynecol 2011;18:569–81. 2. Kupesic S, Kurjak A, Skenderovic S, Bjelos D. Screening for uterineabnormalities by three-dimensional ultrasound improves perinataloutcome. J Perinat Med. 2002;30:9–17. 3. Preutthipan S, Linasmita V. A prospective comparative study betweenhysterosalpingography and hysteroscopy in the detection of intrauterinepathology in patients with infertility. J ObstetGynaecol Res. 2003;29:33–37. 4. Hinckley MD, Milki AA. 1000 office-based hysteroscopies prior toin vitro fertilization: feasibility and findings. JSLS. 2004;8:103–107. 5. Benacerraf BR, Benson CB, Abuhamad AZ, Copel JA, Abramowicz JS, Devore GR ,Doubilet PM, Lee W, Lev-Toaff AS, Merz E, Nelson TR, O’Neill MJ, Parsons AK,Platt LD, Pretorius DH, Timor-Tritsch IE. Three- and 4-dimensional ultrasound inobstetrics and gynecology: proceedings of the American Institute of Ultrasound in Medicine Consensus Conference. J Ultrasound Med 2005; 24: 1587–1597. 6. Sylvestre C, Child TJ, Tulandi T, Tan SL. 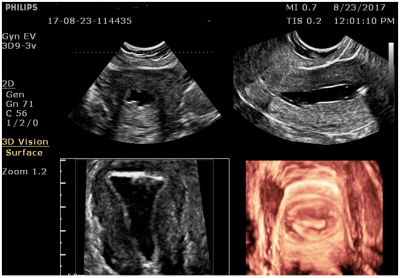 A prospective study to evaluate the efficacy of two- and three-dimensional sonohysterography in women with intrauterine lesions.FertilSteril 2003; 79:1222–1225. 11. Sylvestre C, Child TJ, Tulandi T, Tan SL. 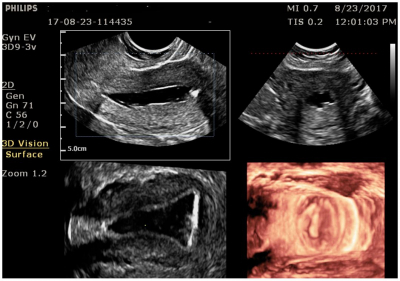 A prospective study to evaluate the efficacy of two- and three-dimensional sonohysterography in women with intrauterine lesions. Fertil Steril. 2003;79:1222–1225. 12. Lagana AS, Ciancimino L, Mancuso A, Chiofalo B, Rizzo P, Triolo O. 3D sonohysterography vs hysteroscopy: a cross-sectional study for the evaluation of endouterine diseases. Arch Gynecol Obstet. 2014;290:1173–1178.